This page is a resource that we use for Christian bible study. We have developed some of the information on this page and we have borrowed information from other studies which are freely available. Our intent is to provide a study resource that we can access when traveling. We do not disagree with anyone's personal interpretation of scripture and our thoughts are not offered as an argument for the perspective from our understanding of this revelation. Please feel free to read or use the study material if it is of help. Thank you - Love, Peace and Joy. 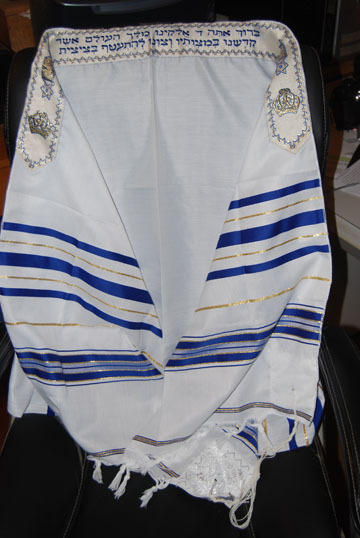 This is a picture of one of our tallits (טַלִּית‎‎)- that is one of our prayer shawls. Jewish folks wear a tallit during morning prayer and during all prayers on Yom Kippur. Note the twisted knots on the fringe of the tallit; the longer knotted fringes at the four corners are termed tzitzit (also spelled tzizit). As Christians, we do not wear our tallit for all prayers, rather at special times as a remembrance of God’s wonderful grace that is provide through His Son, Jesus Christ. Scripture does not actually define the use of a tallit, rather it is the tzitzit which is defined in the Old Testament book Numbers, chapter 15, verses 38-39 and also in the Old Testament book Deuteronomy chapter 22, verse 12. Numbers 15: 38-39: the Lord speaking to Moses - "... make tassels (tzizits) on the corners of your garments throughout all generations ... and ... put a cord of blue on the tassel (tzizit) of each corner ... the tzizit is for you to look at and remember all the commandments of the Lord ... to do them ... not to follow your own heart or eyes ..."
A tallit can be made of any materials except a mixture of wool and linen. Note there is a stipulation, in the law of Moses, for a blue thread to be included in each tzizit of a tallit or similar garment. The chemical required to make the dye for this blue thread, termed tekhelet (תכלת), was unknown for two thousand years and only just rediscovered in Israel during the 1990s. It is made from the contents of a gland found in a specific salt water shell fish. Most tallits purchased today do not have the tekhelet thread, though such threads are now available. The spiritual significance of the tallit, tzizit and tekhelet thread are another study in themselves; our purpose in this study is to review the prayer which is written on all tallits. Note the prayer in Hebrew across the crown of our tallit. The crown of the tallit is also termed the neckband or atarha and most often has this prayer embroidered on it. This is the prayer, or if you prefer, the blessing which is said verbally when one puts a tallit on. This blessing is derived, or if you prefer a variation, of the prayer (blessing) which is recited by Jewish folks before they read or study the Torah (the Hebrew name for first five books of the Old Testament). This prayer for Torah reading and study is called: “La’asok b’divrei Torah”; the Hebrew word la’asok has the meaning to engage, to busy oneself, to immerse oneself – thus it is a blessing to immerse oneself, daily, in the revealed word of God. Blessed art thou, Lord our God, King of the universe, who sanctifies us with Thy commandments and commanded us to immerse ourselves in the words of the Torah. This prayer, La’asok b’divrei Torah, is said verbally prior to study or reading of the Torah. The Hebrew words on our tallit are similar to La’asok b’divrei Torah but not quite the same. There are actually two prayers (blessings) which are said verbally when you put a tallit on. The first is the actual blessing which is written on the crown of each tallit and the second is spoken with the tallit on - holding the tzizit. Blessed art thou, Lord our God, King of the universe, who has sanctified us with His commandments and commanded us regarding the tzizit. Blessed art thou, Lord our God, King of the universe, who has sanctified us with His commandments and commanded us to wrap ourselves in the tzizit. As we review these two prayers, blessings, associated with the use of our tallit and its tzizits, we should consider what we are praying. Jewish folks verbally speak these two prayers within the context of their source within the Torah (תּוּכﬣ). Their actions, which are from their heart, are an obedience to the revealed word of God as they have it within the law of Moses. Consequently, there are many other rules, customs and regulations which have arisen, within the Jewish faith, related to tallits and tzizits. For Jewish folks of a strict orthodox perspective, only men can wear a tallit - however - Jewish folks of the reform tradition permit women to wear a tallit - though - there are many Jewish folks, of the reform tradition, who would consider it not appropriate for non-Jewish folks to wear and use a tallit in prayer. Each tzizit on each corner of a tallit has eight threads and ten knots. The blue thread, that is the tekhelet thread or Shamash, if it is present will always be the longest thread of a tzizit. On a tallit, the four tzizits, each with eight threads and ten knots can be counted in various ways to equal 613 which is the number of commandments which God gave the people of Israel in the Torah. "Wrapping" themselves in the four tzizits of a tallit is a reminder, to Jewish folks, that God has sanctified the Jewish people, that is set them apart for His purpose. As Christian, we too are set apart however we are no longer under the covenant which God established with the Jewish people in the Torah. The revelation of God, to the Jewish people,in the Torah (תּוּכﬣ) is the law of Moses. In the context of our faith in Jesus Christ, as the Son of God, the meaning of tallit and tzizit change. Christians read the Torah and see the revelation of Jesus Christ, our Savior and Lord, who has redeemed us from our sinful nature and actively makes atonement for us. The Christian is under a new covenant (כּדיﬨ) with God which is based on God's grace. Grace comes to us through our faith in Jesus Christ, and not through the 613 commandments (laws) of the Torah. Paul in his epistle to the Hebrews, in chapter 8, verse 6 says: "... the followers of Jesus Christ have a better covenant because it is based on a better promise" - that promise is grace. This study is on the two prayers, or if you prefer blessings, which are spoken verbally when one puts on a tallit. Many Christians, world wide, have recently discovered the wonderful use of the tallit as an aid in our prayers and devotion to God. As the Christian "wraps herself or himself in the tzizit" the reminder is not only to the 613 commandments which God gave to the people of Israel but also to the grace which comes to us through our faith in Jesus Christ our Savior. Grace, in uncountable situations, to live our lives so they express God's love for people and the love we have in our hearts for Him. God through the gift of His Son, Jesus Christ has purchase, for us, this gift of grace - this is grace which provides the Christian with a liberty that goes well beyond the 613 commandments found in the Torah. The remembrance of the 613 commandments of God in the Torah as we begin prayer with a tallit is a remembrance and awareness that we, as Christians, cannot please God by our own actions or merits, rather it is this grace we have through our faith in Jesus Christ which has transformed our lives here on earth and provided the sure promise of life everlasting with God in heaven. We'll see that the first prayer, blessing, are the words embroidered on each tallit. The second is spoken with the tallit on, holding the four tzizit - a remembrance + awareness of God's grace in our life through our faith in Jesus Christ, our Savior.